In a brief departure from my usual topics, there is a current event this week that is too good to leave unmentioned. As America's midwest is inundated with snowstorms and winter weather, the summer along Australia's Queenland's Gold and Sunshine coasts have brought with it monstrous amounts of seafoam, that normally majestic and stereotypical symbol of the ocean. Periodic seafoam inundation is not altogether uncommon for beaches, but the sheer amount of foam this week is far beyond the norm. The barage of foam was released due to recent tropical storms in the area, and is now coating several towns. Citizens appear to be enjoying the event, but the foam can be an inconvenience as it is up to 9 feet high in some areas. Seafoam is in fact caused by billions of dead microalgae, called diatoms, which decompose and cause the frothy texture. Diatoms are neat little creatures. They are photosynthesizing organisms, like microscopic plants that originated about 40 to 60 million years ago. They are also encased in glass-like silica shells which give them a beautiful geometric appearance when viewed under the microscope. 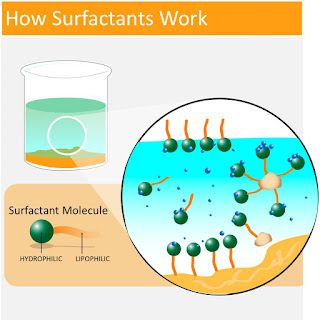 When diatoms die and decompose, their bodies have surfactant properties. Surfactants, like household soap, have both polar and non-polar properties which have the ability to bond with both hydrophilic (water-loving) and lipophilic (lipid-loving) substances. That is how dish soap breaks down grease on your dishes. The result is that these broken down organisms act as a soapy substance when the wind whips them up: foam! The sheer volume of the bloom that must have whipped up this much foam is incredible indeed. Diatoms are quite harmless, so people playing in the foam are not in danger of any type of toxins. 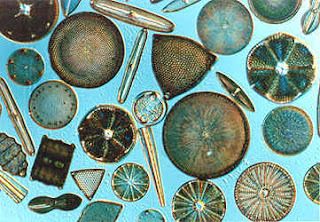 On the other hand, diatoms are often confused for another group of photosynthetic organisms that they appear in close conjunction with, dinoflagellates. 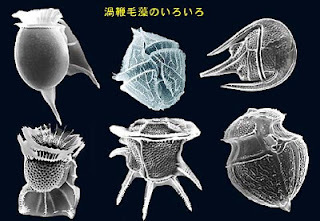 Dinoflagelletes are similar to diatoms, but are also responsible for toxic algal blooms (such as red tides) that can poison people and animals. Dinoflagellates under a scanning electron microscope. Dinoflagellates also have bioluminescent properties, meaning they can create their own light. During a larger bloom, observers may notice the ocean glowing as if lit from underneath - a truly beautiful sight! The author was lucky enough to observe this phenomenon in 2011 off the coast of northern California. I hope you enjoyed today's post, and that now when you are lucky enough to see seafoam or a glowing ocean, you can tell your friends which microorganisms are responsible for each! Oh? And that glow you see when your headlights hit the paint in the middle of the road? You can thank diatoms for that too. Useful organisms, indeed.